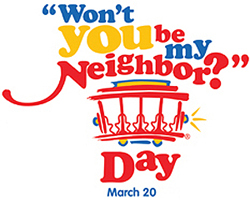 March 20th would have been Fred Roger’s 82nd birthday, and we’re celebrating his legacy on our third annual Won’t You Be My Neighbor Day. You can join in by wearing a sweater and doing something neighborly. Participants so far include knitting stores, libraries and preschools who are creating to celebrate some of the many ways we are all neighbors – helping one another, reaching out to meet a new neighbor, making something special to give to someone, and saying thank you. Many cultural institutions will be celebrating by offering free or reduced admissions to children and families. The United Way of Allegheny County, is using Won’t You Be My Neighbor? Day as a way to kick off a “commitment to volunteer” effort, as well as to say thank you to their volunteers. The day’s activities will include volunteer fairs at corporations and community sites, where agencies will be available to promote volunteer opportunities. Won’t You Be My Neighbor? Day gives everyone the opportunity to say ”Thank you” to your neighbors, — for their ongoing support of your work and is a great way to honor Fred Rogers’ legacy. This entry was posted on Thursday, March 18th, 2010 at 1:00 am and is filed under Events. You can follow any responses to this entry through the RSS 2.0 feed. You can leave a response, or trackback from your own site.